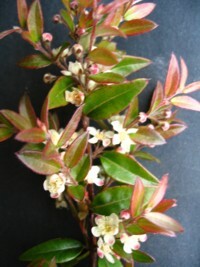 A very hardy and dense tree with beautifully coloured new foliage of red and dark pink. Bears white flowers followed by purple to white fruits. Makes a great windbreak tree. One of the most spectacular native trees that there is. 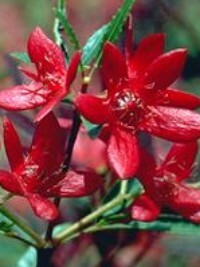 Beautiful, green shady foliage and masses of large red flowers over several months in spring. 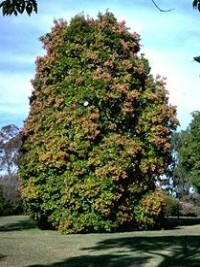 Great specimen tree and bird-life attractor.Grows to 8m high in the full-sun. 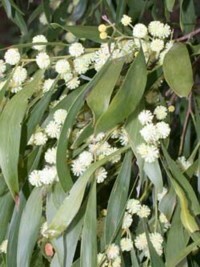 A great foliage plant to create that tropical feel in the garden and also makes an attractive feature around pools.The 1 metre long foliage stems bear white flowers, followed by blue globular fruits.The young growing tips of the creeping rhizomes have a distinct Ginger flavour and were used as bush tucker by Aborigines. The leaves were also used to wrap food in to be cooked. Beautiful, East Coast , native palm. Tall and fast growing palm often found growing in moist gullies with rainforest tree species but is still at home in the open. Is more frost-tolerant than the North Qld species Alexandria Palm. 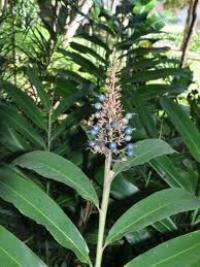 Well worth growing for its lush, tropical appearance. Bears bright red fruits (inedible to people, but native animals love them). 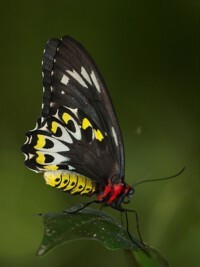 Naturally found in rainforest, rainforest margins and wet sclerophyll forest from NE NSW to SE QLD this evergreen climbing vine is the food source and attractor of the rare Richmond Birdwing Butterfly .Can be trained on a strong trellis or let grow to the tops of trees to enhance the canopy. 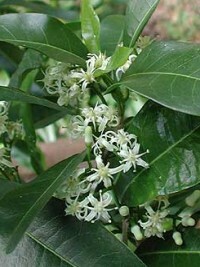 A very hardy rainforest tree with very large, shady, glossy leaves which are partly or fully dropped off the tree prior to flowering before Christmas. Brilliant, bright-red flowers over several months. Grows to 10m in the full-sun. 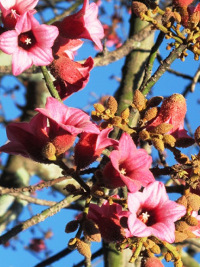 Another beautiful member of the Bottle-Tree (Brachychiton) family with distinctively lobed dark green leaves and masses of cherry coloured bell type flowers to 5cm in diameter in Summer. A long lived and very worthwhile specimen tree. 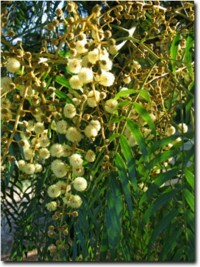 Beautiful smaller tree with a dense canopy of dark-green leaves and large pendulous spikes of creamy-white flowers in summer.Grows to 8m in the full-sun. 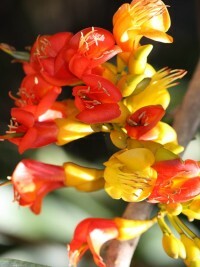 Beautifully shady, Native legume tree which bears large yellow and red pea-type flowers. Also a very useful shade and riverbank stabilisation tree. A tall, fast growing and widely planted She-Oak for riverbank stabilisation and windbreaks. 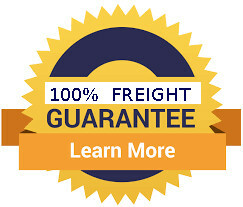 Grows 2 - 3m per year in its first few years of growth.Frost resistant. A medium sized she-oak which is a bit more dense than the other she-oaks. Makes a good windbreak in good to very dry conditions. Seed cones attract Black Cockatoos.Frost resistant. One of the most attractive She-Oaks, having a dense, dark green crown (red tinged for part of the year) of weeping branches / foliage. Seed cones are the staple diet of the Black Cockatoo.Frost resistant. 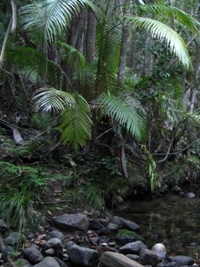 The well known Australian East Coast tree which was ruthlessly felled by early timber-getters.This beautiful and very long-lived tree must be planted within breaks in already established forest to grow at its very best and in these conditions is one of the fastest growing rainforest trees. Beautiful rainforest tree suitable for exposed conditions as well as protected. Dense, dark green foliage provides great shade. 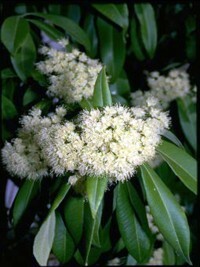 Being in the same Family as the Christmas Bush this showy tree bears masses of cream flowers and calyx turns reddish upon maturity. Older specimens have a buttressed trunk. 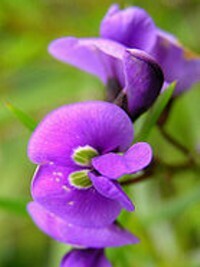 A hybrid of NSW Christmas Bush which is particularly unusual for its magenta-purple new foliage. 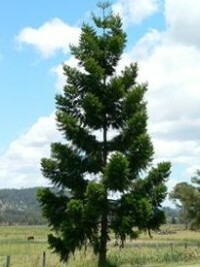 Has a very dense growth habit to about 3 metres in height.